We’d love your help. 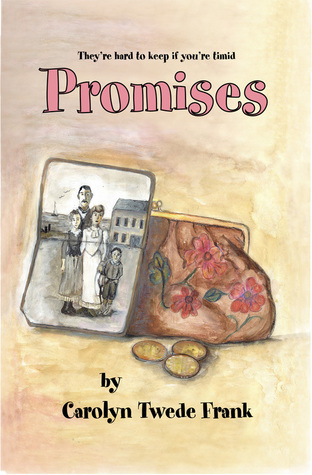 Let us know what’s wrong with this preview of Promises by Carolyn Twede Frank. To ask other readers questions about Promises, please sign up. I spent quite a few of my early years, up until I was about 8 years old, living in Southern Utah very near Zion's Park. The setting of this book was around the area of Bryce Canyon. If you've never experienced the beauties of Southern Utah, you really should. The red rocks of the area are so beautiful to me. Even no I think the summary really gives you the whole run down of this story. "Promises is a heartwarming story of friendship...and adventure." That is exactly how I would sum up this story. Even though this is a middle grade/ya novel, I was thoroughly entertained and involved in the storyline. The mystery of Hattie trying to find out about the girl who had previously lived in her house, and left some belongings, kept the story moving forward.I also was moved by the family dynamics in this novel. Hattie belongs to such a wonderful and supportive family. But not everyone she comes in contact with, has a family like this. So Hattie is constantly challenged with making choices, keeping Even though this is a middle grade/ya novel, I was thoroughly entertained and involved in the storyline. The mystery of Hattie trying to find out about the girl who had previously lived in her house, and left some belongings, kept the story moving forward.I also was moved by the family dynamics in this novel. Hattie belongs to such a wonderful and supportive family. But not everyone she comes in contact with, has a family like this. So Hattie is constantly challenged with making choices, keeping promises and also staying true to who she is. Hattie is a fabulous character that kids and adults will like. She is very timid, and it is quite fulfilling to see how she grows and changes over the course of the novel. As a parent, I am always on a constant journey to find books that are clean, no bad language, and also well written. I am so happy to tell you this is a wonderful book that fits the bill of what I'm always looking for. Promises is based on an LDS family and some religion is discussed, but nothing preachy. I love the fact that the characters pray when they need help. So I highly recommend Promises to you and your children. This is such a wonderful story, which reminds me a lot of the "Little House" series. From the back cover: Promises is a heart warming story of friendship with a touch of mystery and adventure set in the days before Bryce Canyon became a national park. Drawn from the memoirs of Hattie Adair Jolley and her children, it is a realistic glimpse into the past and a delightful story for readers ages eight to eighty. What I thought: It took me a short shifting of gears to get into the middle grade language and style, but I found myself enjoying this delightful story. Author Carolyn Fran From the back cover: Promises is a heart warming story of friendship with a touch of mystery and adventure set in the days before Bryce Canyon became a national park. Drawn from the memoirs of Hattie Adair Jolley and her children, it is a realistic glimpse into the past and a delightful story for readers ages eight to eighty. Hattie is barely twelve when her pa’s “business adventures” disrupt her family and move them to the new town of Tropic, nestled in the shadows of old Ebenezer Bryce’s Canyon. Her pa views the town as opportunity. Hattie is hopelessly shy and views it with apprehension; she dreads the task of making new friends. More than anything else, Hattie wants to be like her father—not afraid of meeting new people, talking to strangers, and standing up for herself. So it is with trepidation that she accepts Hattie is barely twelve when her pa’s “business adventures” disrupt her family and move them to the new town of Tropic, nestled in the shadows of old Ebenezer Bryce’s Canyon. Her pa views the town as opportunity. Hattie is hopelessly shy and views it with apprehension; she dreads the task of making new friends. More than anything else, Hattie wants to be like her father—not afraid of meeting new people, talking to strangers, and standing up for herself. So it is with trepidation that she accepts her pa’s challenge and promises to make new friends. Promises is a heartwarming story of friendship with a touch of mystery and adventure set in the days before Bryce Canyon became a national park. Drawn from the memoirs of early Utah settlers, it is a realistic glimpse into the past and a delightful story for readers ages eight to eighty. This is a really cute sweet story about a year (mostly) in the life of a Utah pioneer girl living in a small town on the edge of Bryce Canyon. Based on the stories of the author's ancestors, I think. I really enjoyed it! About my writing: I don't like to write candy for the brain. But I do like to try to make my books not only fulfilling, but entertaining. Candy is nice, but a meal of meat, potatoes, and veges can leave you more satisfied. My books give the reader a good taste of history and/or science along with a dash of mystery folded into the story. About me: I've always loved writing, but haven't gotten serio About my writing: I don't like to write candy for the brain. But I do like to try to make my books not only fulfilling, but entertaining. Candy is nice, but a meal of meat, potatoes, and veges can leave you more satisfied. My books give the reader a good taste of history and/or science along with a dash of mystery folded into the story.